Want to better understand the big picture macro market developments? Get access to our favorite ETF ideas via ETF Pro. This is a big call. The U.S. Dollar is up 5% from its February lows. 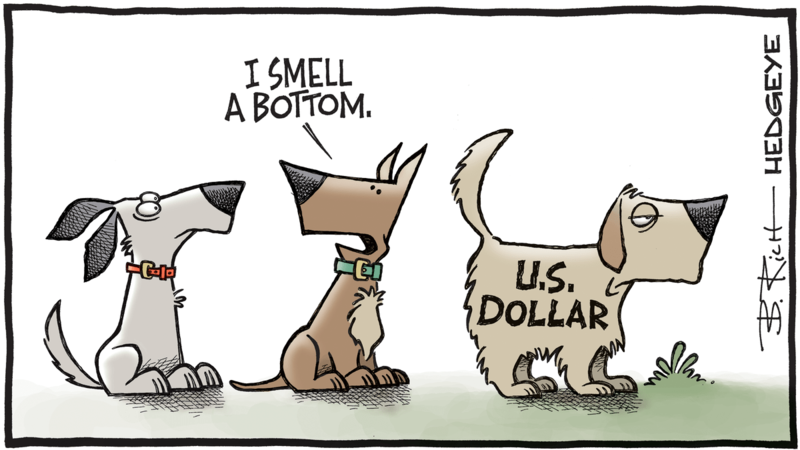 "As far as I know, we’re the only Independent and/or Macro Research firm that made the call that the US Dollar was #Bottoming at the beginning of April 2018," wrote Hedgeye CEO Keith McCullough earlier this week. "If there are others, happy to have them on board. This isn’t the crowded ship many others are on!" The U.S. Dollar bottom is reverberating throughout financial markets (and in some cases wreaking havoc). Dollar strength is already beginning to exacerbate some long-time problems... like in Argentina. The country is seeking an emergency $30 billion loan from the IMF after three straight interest rate hikes failed to arrest the falling peso. Other Emerging Market are also feeling the pain of a strengthening U.S. dollar. The Emerging Markets stock ETF (EEM) is down -10.8% from its late January high. And on a related note, Gold has fallen -4.7% from its year-to-date highs on dollar strength. Oil rose to levels not seen since 2014 this week. It's up +46% in the past year. That's also be a tailwind for U.S. inflation and pushed U.S. bond yields ever higher. The 10-year Treasury yield recently breached the 3% mark, hitting levels not seen in four years. Why has U.S. stock market picked up? We've been warning subscribers that the stock market is frontrunning a number of really bearish catalysts (some of which are already beginning to surface... others are lurking in the back half of 2018).